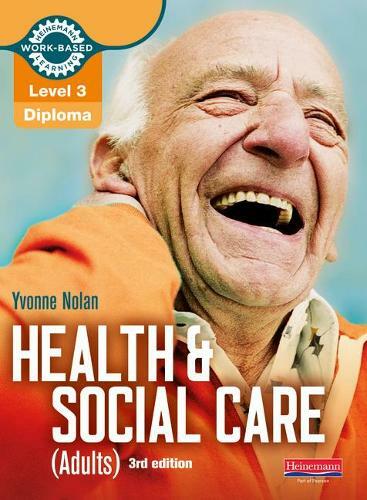 * Written in line with the QCF to provide comprehensive support for the new Diploma in Health and Social Care, which has replaced the NVQ. * Covers the mandatory units alongside a selection of the most popular optional units to help ensure candidates have everything they need to help gain success with the new specifications. * Written by best-selling author Yvonne Nolan, so you can be confident you have the expert support your candidates need to succeed. * Extensive coverage of every aspect of the qualification, including key information such as legislation and theory given in clear, succinct ways. * Personalisation is integrated throughout, to help candidates put the individual at the heart of care. * Assessment advice for every topic in each unit ensures your candidates have everything they need to succeed. * Engaging case studies and real-life examples bring learning alive, helping your candidates to apply their learning. * A motivating variety of content keeps reluctant learners engaged, whilst the smaller book format makes the books more portable and easier to use.